This ad has been viewed 1247 times! 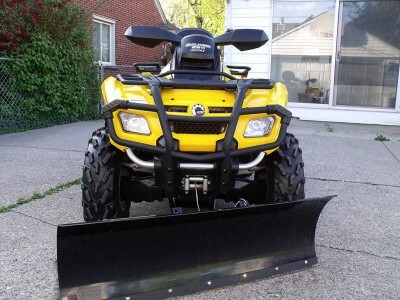 2007 Can-Am BRP Outlander 650 MAX XT HO EFI w/ Plow NR! 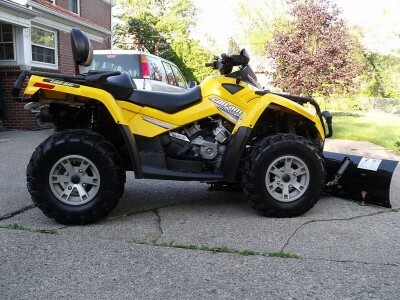 2007 Can-Am BRP (Bombardier Recreational Products) Outlander 650 H.O. 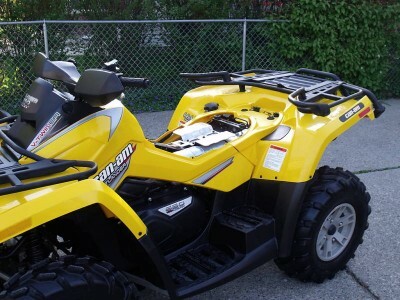 EFI MAX XT, 2-up touring/utility ATV. It is in very clean, excellent overall condition with very little use (53 hours/680 miles). I bought the ATV from the original owner in 2008 when it had (10) ten hours. It was used on private property. Since then, I have used it almost exclusively (some plowing) on groomed Northern Michigan trails. The ATV has not been worked. It is in perfect mechanical /operational condition. Everything functions and operates as it should. The exterior/body is in excellent overall condition with some very light surface scratches on the plastics. No rips, tears, dents, etc. Garage stored since new. Adult owned and operated. Hauled only a few times in an enclosed trailer. The ATV is 100% factory stock with no aftermarket upgrades or modifications. The 48" Cycle Country winch controlled plow in in excellent condition. It has a (3) three position manually controlled release lever for desired blade placement. The plow easily detaches from the underbody mount. The plow hardware, mounting plate, arms, and blade are all in excellent condition. I am including a brand new, never used Can-Am BRP rear storage/cargo bag, and a quick release hitch system that has a 1 7/8", and 2" ball. I have all the original owner's manual(s), and paperwork. No disappointments. Clear title. The MAX package offers seating, and comforts for a secondary passenger. The XT package offers front and rear bumpers/brush guards, handguards, a 2,500 pound BRP / Warn Winch with handlebar mounted, and wired remote operated controls, and upgraded cast aluminum rims with upgraded oversize, off-road tires. Has a fully-automatic transmission (P,R,N,H,L), and offers push-button, 'shift-on-the-fly' four wheel drive (front Visco-Lok differential).